For a complex project with many moving pieces, finding the right place to start can be difficult. We want to make sure we have a good foundation so that there will be less stress as we continue to add components. In order to accomplish this, I chose to start with the configuration of the Top-of-Rack HP 5900AF switches. The 5900AF switches will be connecting to our Virtual Connect shared uplink sets to our provisioning servers and the external servers that run the vSphere and management applications. By setting up an IRF domain, we can insure active/active links from both Virtual Connect modules without looping conflicts. Using the supplied Serial console cable that came with the HP 5900, connect the RJ45 end to the console port on the back of the primary Switch and the serial connector to a serial to usb adapter(e.g Keyspan USA-19HS). Open a terminal emulator or PuTTY for the correct COM port. After the switch is powered up, press <ENTER> to continue. 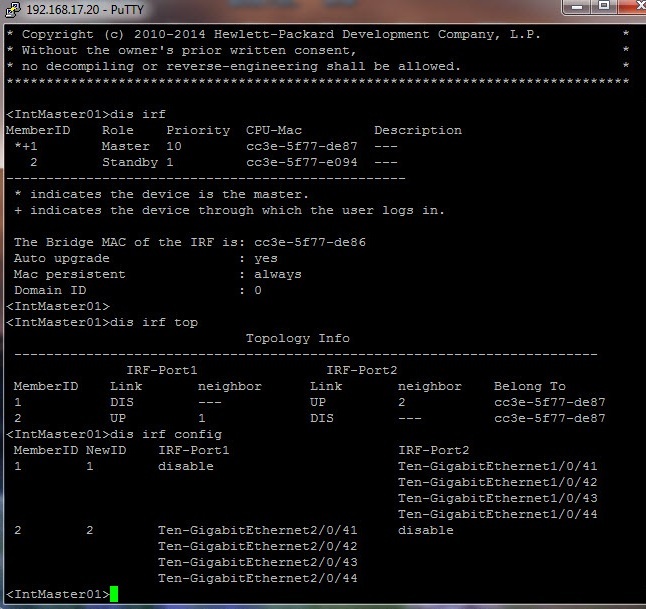 Before configuring IRF, we’ll start by adding a system name, user account, SSH and SNMP setup for HP iMC integration. After using iMC, I like having the ability to quickly visualize all the interfaces, VLANs and link-aggregation groups for the entire network. You will note that a few of the commands I use in the command line are shortened versions of the full commands. Both will work, but it’s much faster to type ‘sys’ instead of ‘system-view’. After starting up the console will display the current system name, the default being <HP>. To assign a new name we must enter system-view and assign the new name. In this example we’ll assign the name ‘Master01’. Next we configure VLAN interface 1 for management access and configure SSH. This must also be completed in ‘system-view’ as with most configuration changes. Now that the basic switch configuration is complete we can start on setting up IRF for the two switches. I chose to use Ten-gigabit ports 41-44 on both switches for the IRF group. After adding the interfaces to the IRF port group, we must do the same on the second switch along with changing the member number. Following this, the secondary switch will reboot and activate the IRF configuration. The configuration should be saved ([Master01] save) as long as there are no issues. We can now check the status of both IRF member switches. In the next section of this project we will be configuring the Virtual Connect Shared Uplink Sets with the 5900 switches and vSphere. Is it just the slideshow that you are having problems with? There were changes made to the code recently on slideshow galleries, and I am not certain if I like the end result. Hence why I’ve changed a number of the galleries in slideshow to thumbnail. I don’t really like the thumbnail style, but it’s a work in progress. I’ll keep tinkering, but I appreciate the heads-up that it’s not functioning as well as it should.